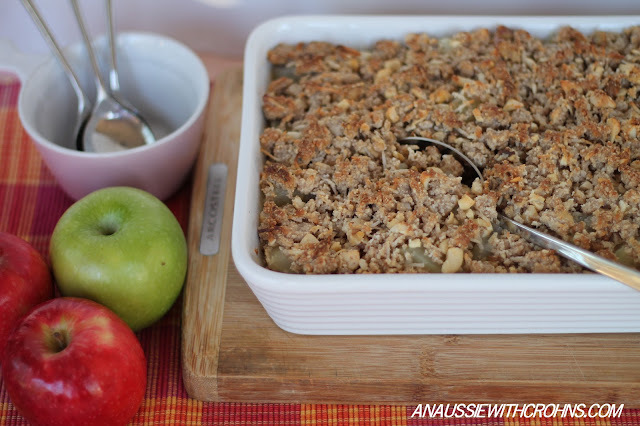 Isn't Apple Crumble the easiest and most satisfying dessert? This crumble is just right - sweet, spicy, chewy and moorish. Enjoy! 2 x 770g tins of pie apple. 1 cup mixed nuts (roughly chopped) I used cashews, macadamias and walnuts. Put the pie apple into a baking dish. Mix together the almond flour, coconut, mixed nuts and spice. Melt the coconut oil in the microwave (about 30 seconds) and add to dry ingredients. Melt the honey briefly in the microwave (about 15 seconds) and add. Spread nut mix onto apples. Bake in oven for15 mins.